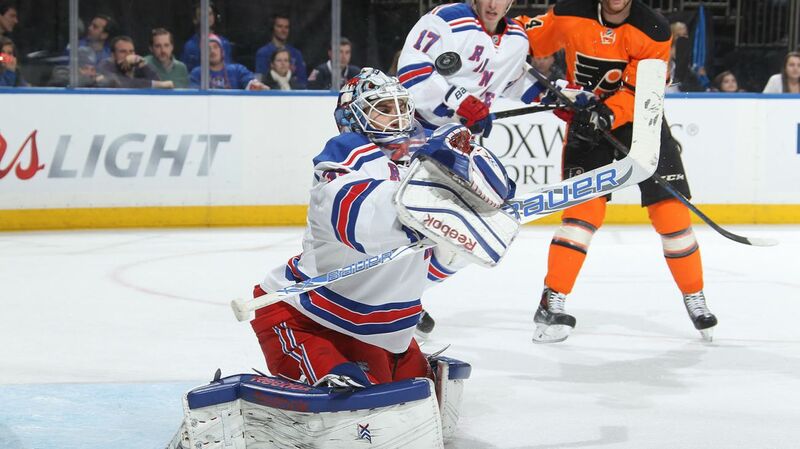 The Rangers ended their three game skid with a 2-0 win over the Flyers. Talbot played extremely well and the Rangers looked much improved from Monday’s game. Photo courtesy of MSG Photos. That was head coach Alain Vigneault after the Rangers (8-7-4) responded to Monday’s loss in a big way, shutting out the Flyers (7-8-2) at Madison Square Garden and ending their three game skid. The Rangers controlled play for most of the game, and outshot the Flyers throughout the second period, until the Flyers pulled their goalie with 3:33 left to play and upped their shot total. Cam Talbot was sensational in net, making 31 saves and shutting down the Flyers for his first win of the year. Talbot made some great saves, including some great breakaway saves on Simmonds and Lecavalier, as well as standing on his head in the last three and a half minutes of the game. Steve Mason was also fantastic, stopping 32 of 42 shots and keeping Philadelphia in the game for the entire 60 minutes. Kevin Klein scored his fourth goal of the season, which ties his career high for the season. Klein has been an offensive force this season as well as providing valuable defensive minutes. The other Ranger to score was Rick Nash, who cashed in on the power play for the Rangers, making it four power play goals in the last five games. Nash’s goal was his 13th of the season, and gives him 20 points on the season (13-7-20). Rick Nash continued his dominance, scoring his 13th goal of the season, this time on the power play. Nash now has 20 points on the season, and has been the best forward for the Rangers all season. Photo courtesy of MSG Photos. The game started out with the Flyers having a good amount of possession, but not getting a lot of shots on net. 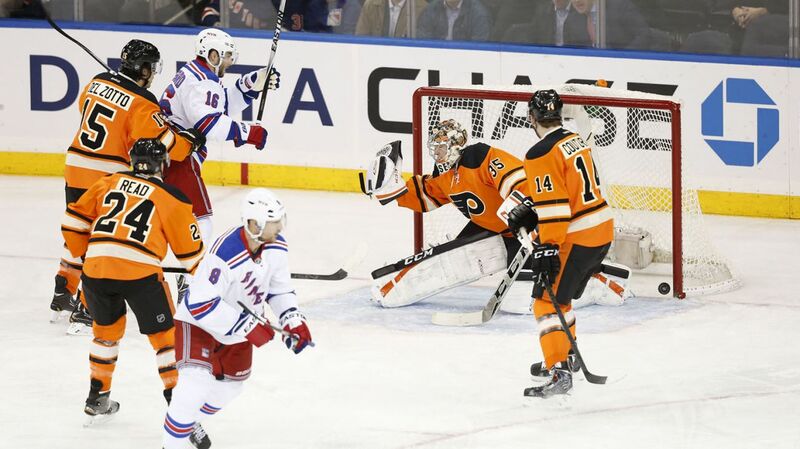 The Rangers had better chances, but Mason made some big saves on a Fast deflection, a Dom Moore wraparound, and a point-blank shot from Hunwick. The Rangers would get one past Mason, as Kevin Klein scored the first goal of the game and put the Rangers up 1-0 just over five minutes into the game. After a puck battle behind the net, Carl Hagelin was able to come away with it, and he passed it to an uncovered Kevin Klein in front, and he fired a wrister top shelf. It was his fourth goal of the season, giving him six points on the season. 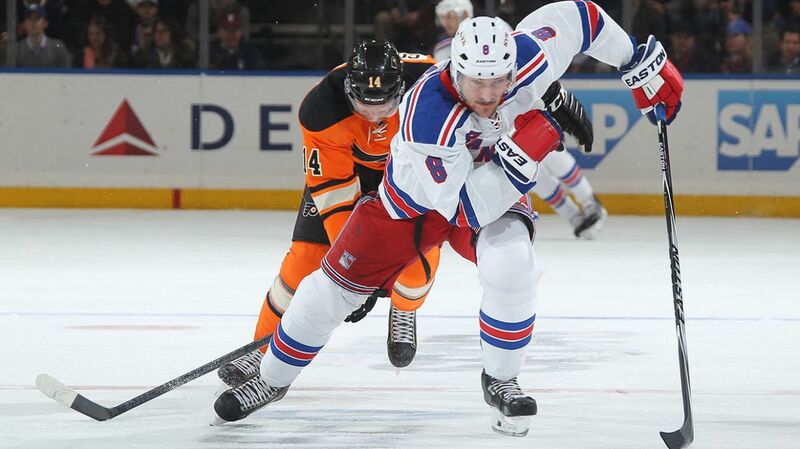 Kevin Klein fired a wrister past Steve Mason for his fourth goal of the season, equaling his career high. Klein leads the Rangers defensemen in goals, and is tied for the lead in points. Photo courtesy of MSG Photos. The rest of the period was mostly controlled by the Rangers. Mason would make key stops on Mats Zuccarello’s backhand, a Dan Boyle slap shot, and a Nash breakaway, as well as many other shots. The Rangers were outshooting the Flyers 10-3 with about six minutes to go. The Rangers picked up right where they left off in the second period, getting a chance on an odd man rush, and Zuccarello hit the post with his shot. The Rangers would draw a slashing penalty, and they capitalized on the man advantage, with Rick Nash finding the back of the net. Stepan started the play at the point, and made a nice pass to martin St. Louis. St. Louis made the perfect pass through the crease to Rick Nash on the far side, and he tapped it in to give the Rangers a two goal lead. The Rangers continued to control play, outshooting the Flyers 10-2 at the halfway mark of the period. They would also get some more good chances, and Chris Kreider nearly scored, but hit the post. Cam Talbot made some huge saves this period that kept the Flyers scoreless. After a weird bounce off of the boards, Talbot was able to recover and rob Wayne Simmonds, who had a wide open net just a few seconds earlier. He also stopped Vincent Lecavalier on a breakaway shortly after the save on Simmonds. Cam Talbot made some great saves en route to his 31 save shutout, and his first victory of the season. Talbot looked very comfortable and was much sharper than he was in his last three starts. The Rangers finished the second period up by nine shots, and were largely outplaying the Flyers. If it wasn’t for Mason, the Rangers could have been up by a lot more. In the third period, the Rangers and Flyers traded chances, with both goalies making big saves and keeping the score at 2-0. With 3:33 left in the third period, the Flyers pulled Mason to give them a man advantage. In that three and a half minutes, Philadelphia fired a ton of shots on net, coming close multiple times, but Talbot made about six or seven great saves during that sequence, earning his victory and first shutout of the season when the horn sounded. Tonight’s game was a complete parallel to the Lightning game. 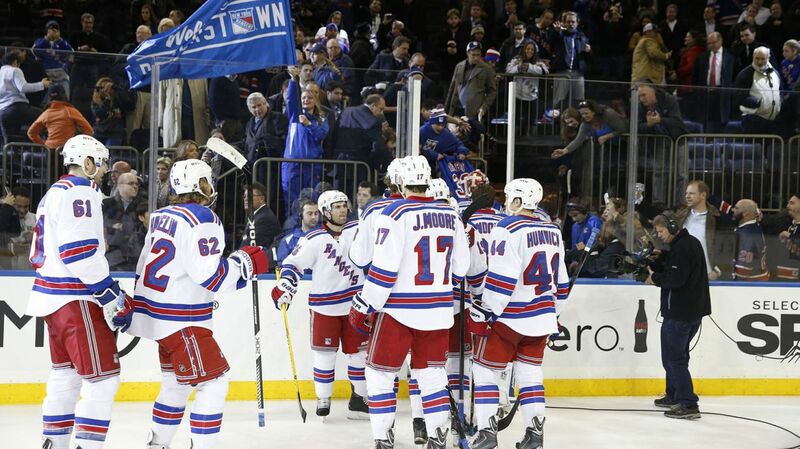 The Rangers were making smart decisions with the puck, winning puck battles, and getting a ton of good chances. They also looked more motivated than their counterparts, and generally played harder throughout the game. The Rangers fourth line also was very effective tonight. On multiple occasions, Tanner Glass, Dominic Moore and Jesper Fast were able to put pressure on the Flyers and keep the puck in their zone, playing valuable minutes for the Rangers. Glass also nearly scored, but was stopped by the glove on Mason. It was nice to see the bottom line work well. For Cam Talbot, this was a much needed victory. He had struggled in his first three starts, and tonight is a big confidence booster for him. Talbot made a few really good saves, and was successful in giving Henrik Lundqvist a much needed day off. In Buffalo, I wouldn’t be surprised if Talbot starts again, which would give him five starts in 20 games, a good ratio to Lundqvist’s starts. However, Talbot will be starting one of the games against the Flyers next week, when the two teams play a home-and-home on back-to-back days. Mats Zuccarello had a very good game. “Zukes” was all over the ice, nearly scoring a on a few occasions and playing a strong defensive game tonight. He wasn’t on the score sheet, but he played really well. Who would have thought that Kevin Klein would lead the defensemen in goals and points early in the season? Klein’s four goals are good enough for first on the team, and his six points are tied with Matt Hunwick for defensemen. Klein has seemed to find his scoring touch, and has been great defensively as well, especially after the McDonagh injury. Kevin Klein has been tremendous for the Rangers this season, and has picked up the slack with Ryan McDonagh out. He has also found his offensive game, which certainly helps shape him into a well-rounded defenseman. Photo courtesy of MSG Photos. 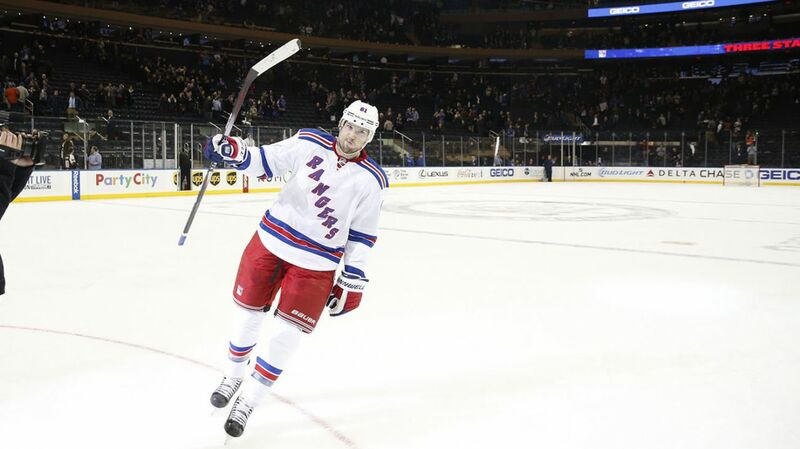 Rick Nash continues to score, and his 13 goals put him at second place in the league, behind the Stars’ Tyler Sequin. Nash scored on the power play, which has been on the upswing for the Rangers recently. Bottom line, Nash continues to find ways to score, and the Rangers keep feeding him. Once this team gets rolling, having Rick Nash scoring a ton will make them even more dangerous. Martin St. Louis earned the primary assist on Nash’s goal with a beautiful cross-crease pass. St. Louis now has nine points over his last nine games (6-3-9) and has flourished since being moved back to the right wing position. 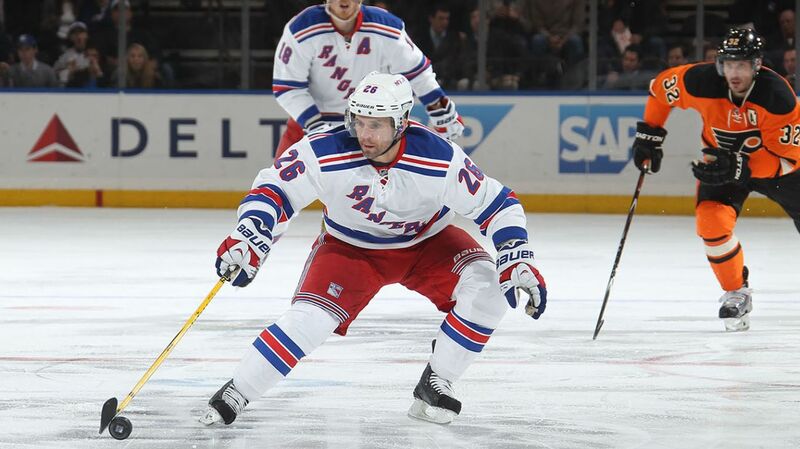 Martin St. Louis has been red hot for the Rangers, tallying nine points in his last nine games (6-3-9). Since moving back to the right wing position, St. Louis has been playing like the all-star he has been throughout his career. Photo courtesy of MSG Photos. Derek Stepan picked up the other assist on Nash’s goal, and has produced and helped out the Rangers power play since his return. In seven games, he has six points (1-5-6) and has really helped the Rangers depth since his return. The Rangers next game will be on the road against the Buffalo Sabres (5-13-2) on Friday night. However, Buffalo has already been hit with four feet of snow and is expecting more. If the NHL believes that the weather poses a threat to the players and the fans, the game will be postponed. But considering the Sabres managed to play their game on Tuesday, I expect Friday’s game to be played. Posted on November 20, 2014, in Game Recaps and tagged Alain Vigneault, Anthony Duclair, Buffalo Sabres, Carl Hagelin, Chris Kreider, Chris Mueller, Claude Giroux, Dan Girardi, Derek Stepan, Derick Brassard, Dominic Moore, Henrik Lundqvist, Jakub Voracek, Jesper Fast, John Moore, Kevin Hayes, Kevin Klein, King Henrik, Madison Square Garden, Marc Staal, Martin St. Louis, Mats Zuccarello, Matt Hunwick, MSG, New York Rangers, NHL, NHL 2014-2015 Season, NY Rangers, NYR, Philadelphia Flyers, Rangers Nation, Rangerstown, Rick Nash, Ryan McDonagh, Tampa Bay Lightning, Tanner Glass, The Duke, The Ranger Zone, Wayne Simmonds. Bookmark the permalink. Leave a comment.